Nose hair length is the newest metric for measuring local air pollution. Photo courtesy of Clean Air Asia. Visualizing air pollution is akin to to understanding several hundred shades of gray smog or looking at the local newspaper’s air quality indicators on a sliding scale of green (good air) dots to red (don’t go outside, ’tis dangerous) lozenges. While both of these are fine indicators that bring home the point of local air pollution and/or low air inversion rates, Clean Air Asia has taken abstract air particulates to an even more personal level. 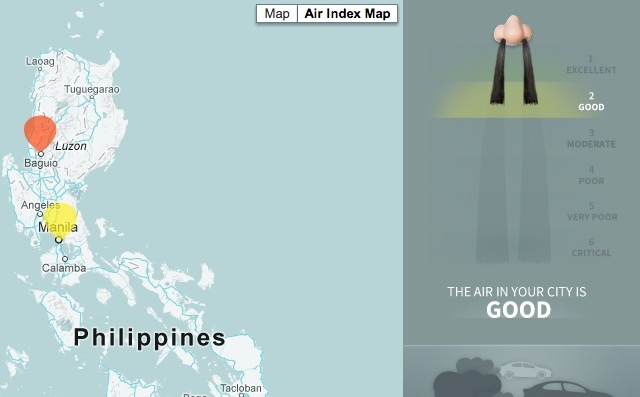 The Clean Air Asia Hairy Nose campaign has created an interactive indicator of poor air quality using nose hair length as a rough metric for just how much nasal fiber one would need to catch and filter harmful particulate matter in Asia’s urban air…the results are not pretty, but make the point obvious. Studies have found that more nose hair gives individuals a three times less likely chance of developing asthma, and the hairy nose metric demonstrates just how vital hirsute nostrils must be to deal with a dirty air epidemic that the World Health Organization notes kills 1.3 million people globally: 800,000 (about 61.5-percent) of those are in Asia. Dirty air and its human eco-system externalities don’t exactly make up the stuff of Friday Fun, however, imagining foot long nose hair lightens (or rather, highlights) the need to lower -or at least trim- air pollution in cities.